I absolutely love when an author I really like puts out a new book -- the anticipation a la Harry Potter, etc. 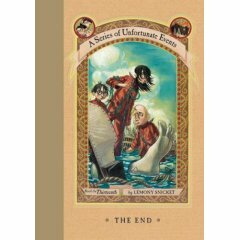 So I was very excited to get the last in the series of the Series of Unfortunate Events by Lemony Snicket, aptly called The End. Yes, it's technically a kid's book, but I love them like adults love Harry Potter -- there's a dry humor to them, and underlying cleverness of irony and satire that adults will pick up on where kids probably won't. LOVE it, and really looking forward to reading them again when Zack is older. 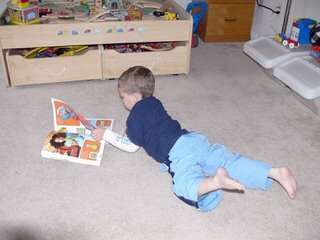 Zack has been loving the toy catalogs that are flooding the mail box these days -- he spends hours looking through them, pointing things out to us that he MUST HAVE (even things he has no idea what they are for, as in the case of the dart board, which we most certainly are NOT getting). I remember getting the Sears Toy Catalog when I was a kid -- that was magic! Tonight is the last of the series of Third Fridays in St. Michaels - I'm getting good at the quick trunk show set up with the jewelry! I've been working, working, working to prepare for November's main shows as well as keeping up with the web site and private events -- nuts around here, no doubt about it. You're probably starting to think about Christmas shopping -- don't forget to visit my web site, as well as my recommended links page to see what other artisans have to offer. Shop early, shop often!